Where is this folder being created at? For example, if it's in the system32 directory, or something, it's probably some windows nonsense that you shouldn't really bother with. But if it's in like, MyDocuments for example, you might want to try running a virus scan against your system as there might be some weird creepy crawlies hiding around on your system that you need to get rid of. You can also run a system diagnostic/monitoring tool provided by windows and look around to see what user/service created a folder with that name. But other than that, can't tell you much more since this is somewhat common with some programs. If you recently installed a service pack on your OS, this type of folder will be created in the %systemroot% folder/subfolder. The service pack installation process normally deletes this type of folder when the process has completed. If it doesnt, these folders are OK to delete, but before you do delete it, it would be helpful to know if this is the case. If not a service pack, have you installed anything else recently. 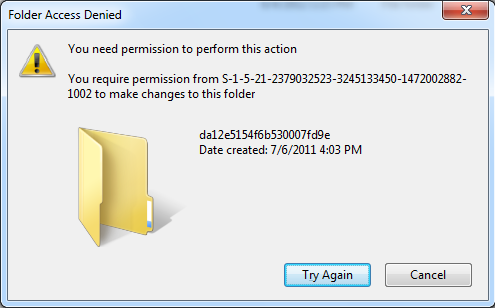 What is the create date of this folder? Can you right click on the folder then select "Take Ownership"? I have safely deleted a number of these folders on my D and E drive with no problem. Sorry. I always install these registry tweaks early in my Windows setup. I'd forgotten that this isn't available with a regular install. Here are the registry tweaks to install and remove the "Take Ownership" context menu command. Copy the blocks into files name AddTakeOwnership.reg and RemoveTakeownership.reg. Double click on the appropriate one depending on whether you want to add or remove.